On November 2nd, 2012 we will celebrate Violet's first birthday even though she isn't here to blow out her candle. A fellow baby loss momma, talented graphic designer, and newly found friend, Bekah, made cards like these in memory of her sweet Corbin. When I saw the idea, I knew that was it. That was the perfect way to celebrate Violet's first birthday! We can pass the love we have for her out into the world as she turns one. Bekah generously offered to do the design. I think they are gorgeous and they also have our little perfect baby on them! 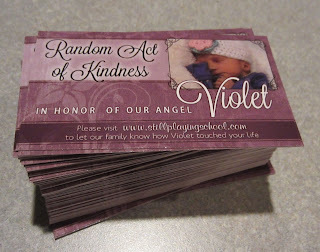 I am so excited at the idea of everyone seeing my girl as they pass along the kindness. You can celebrate with us by getting one (or more) of these cards. The idea is that on her birthday, you do a random act of kindness and with it include this card. Hopefully the recipient will not only pass along the love, but also come to Still Playing School to log how Violet (and you) touched their lives. Please leave a comment to let us know if you'd like to participate and help us remember our sweet baby Vi. Violet brought her wonderful momma and I back together after losing touch for a few years. Love you D!!! I would love to participate as well! That is a great idea, I'll take a few cards please. Love it. How can I get a card? You know that I will want some for Gramps and I to honor her. Love you all. I love this idea! Such a beautiful way to remember and share your beautiful girl! I'd like one (or two) too!